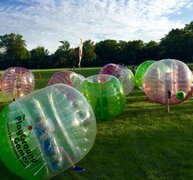 Party Package Rentals | ThePGGames.com Deerfield IL. PlayGround Games offers exclusive party packages for all age groups. The 5 packages below offer a variety of group interaction, one of a kind experiences, and non stop fun for your child on their big day. We can also customize a package for your needs based on the age, number of kids, selections, or theme. We want to know what you are looking for to make your event amazing! *Party Package prices only include the cost of PGG staff and equipment; they do not include the booking of your venue. Please CONTACT US for a list of suggested venues, and available party dates and times. We do not currently own or work in a specific venue. We suggest various park districts, schools, recreation centers, etc. Between May 1st and October 31st we can offer parties outdoors or at your home, weather allowing. All reservations are first-come/first-served. Parties are typically planned for a rental of 2 hours. 30 minute set up, 60 minute party, 30 minute tear down. Our Trackless Train Package is set for 45 minute set up, 120 minute party, 45 minute tear down.